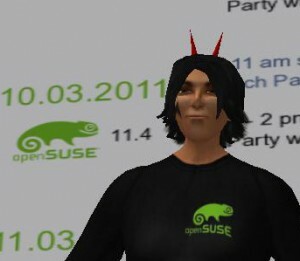 Last week I managed to attend virtual ﻿openSUSE 11.4 Release party in Second Life. I got registered there especially to able to attend this event so it took me some time to figure out how it all works. Although I’m still learning how Second Life works, I’m now able to perform basic tasks and move around freely. Big thanks to ﻿﻿﻿Morgane Marquis for helping me. I’m still learning new stuff and it’s fun.